Webcams can be convenient for a variety of reasons: They show you the current weather, the necessity of certain kinds of clothing - and they are a fun way of checking the state of cities and sightseeing attractions. 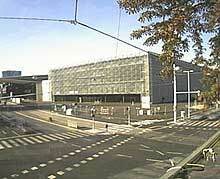 In Graz, there are many webcams. In this article, I have collected some of my favourite Graz webcam websites - as a directory with pre-selected webcams, since many Graz webcams that I have come across are frankly rubbish. Graz.at: Two Graz webcams that you can control with your mouse - one facing the Grazer Uhrturm tower from the Hauptplatz main square, the other one overlooking the roofs of the Altstadt (see screenshot above). 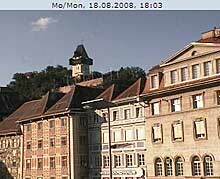 back to "graz & styria" or "austria webcams"